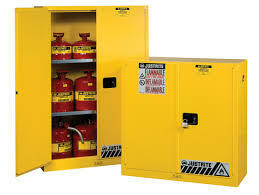 Safety cans and cabinets for the storage of gasoline, other flammable liquids and liquid waste are ideal for all types of industries. A fire can sweep through a building in seconds which is why it is important to store your flammables and hazards in secure safety cans and cabinets. It is important to store these liquids securely to be sure that your facility is protected from these hazards and prevent accidental exposure. We have all types and sizes that are durable and will meet the needs of your particular workplace. Buy with confidence most comply with NFPA and OSHA. If you have questions about your purchase, give us a call or contact us on our online chat.